Way hey, two posts in one day but I just had to share! 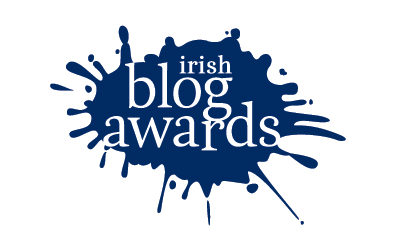 I just discovered that Clasheen is one of the longlisted blogs in the ‘best specialist’ section for the Irish Blog Awards 2010. Thanks so much to whoever nominated me, the section sponsors iQ Content, all the guys and galls who together make these awards such a fun event to be a part of and congratulations to all the other nominees in all the various sections! The other exciting news for today is that I have my new laptop at last! Such a pleasure to work on to date, only used it for about twenty minutes so far but all is going very smoothly so here’s raising a glass to Toshiba tonight. I am really looking forward to loads more memory and plenty of speed, be prepared for lots of posts over the coming months and plenty of pictures of all my felt in progress, hope I don’t wear you out with all my chatter! This entry was posted in Felt and tagged Felt, Irish Blog of the Year, laptop by Nicola. Bookmark the permalink. Never wear us out, as your things are always so fresh, interesting and unique. I am glad that you got a new computer, congrats. You really deserve it. Your blog is my No1 favorite blog. You never cease to amaze me with your ability to manage all the things your life holds, remain creative, find time to share so wonderfully and produce such varied felt pieces. I love that you share so deeply and write in a way that is both easy and delightful. I don’t know about anyone else, but I also love that you share your life too. We get a sense of you which is what, for me, makes your blog more than your average feltmaker blog. Well done Nicola! I read often even if I stay silent. Mazel tov on your new lap top. LOVE your sweet, determined, optimistic, brave blogging!